Represents a reference to a function parameter pack that has been substituted but not yet expanded. 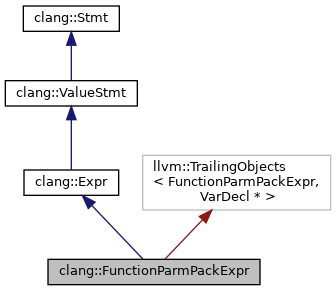 When a pack expansion contains multiple parameter packs at different levels, this node is used to represent a function parameter pack at an outer level which we have already substituted to refer to expanded parameters, but where the containing pack expansion cannot yet be expanded. Definition at line 4227 of file ExprCXX.h. Iterators over the parameters which the parameter pack expanded into. Definition at line 4263 of file ExprCXX.h. Definition at line 4264 of file ExprCXX.h. Definition at line 4280 of file ExprCXX.h. Definition at line 4284 of file ExprCXX.h. Definition at line 4276 of file ExprCXX.h. Definition at line 1549 of file ExprCXX.cpp. Definition at line 1557 of file ExprCXX.cpp. Definition at line 4265 of file ExprCXX.h. Definition at line 4273 of file ExprCXX.h. Definition at line 4274 of file ExprCXX.h. Get an expansion of the parameter pack by index. Definition at line 4271 of file ExprCXX.h. Get the number of parameters in this parameter pack. Definition at line 4268 of file ExprCXX.h. Get the parameter pack which this expression refers to. Definition at line 4256 of file ExprCXX.h. Get the location of the parameter pack. Definition at line 4259 of file ExprCXX.h. Definition at line 4230 of file ExprCXX.h. Definition at line 4231 of file ExprCXX.h.